Then again, there is a whole verse rhyming the surnames of great artists and probably pop music’s only recorded use of the phrase “Wednesday legs”! The song was the title track of an eminently forgettable Brit teen flick with Karl Howman, Caroline Quentin, Gary Olsen, Nick Berry etc that predated John Hughes’ genre classics like Ferris Bueller’s Day Off and Pretty In Pink. It was junk but the soundtrack also included Dave Edmunds, Madness, Bananarama, Altered Images, Sting (eek! ), Pauline Black, Midge Ure and (lo!) Chas & Dave seeing it all come to a head with a rollicking rendition of Auld Land Syne. 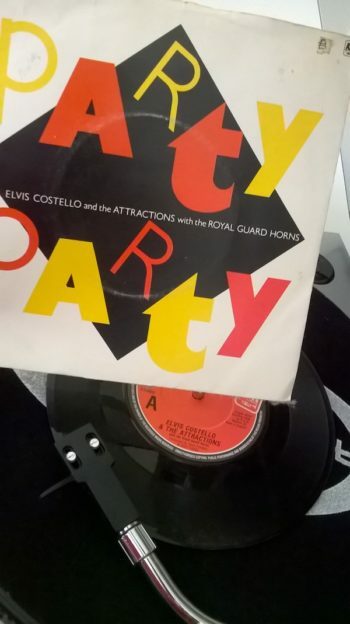 More intriguingly, for such a throwaway a-side, the flip is the beautifully honed title track from the superlative Imperial Bedroom album recorded with Beatles’ studio engineer Geoff Emerick that marked EC’s return to pop after the Nashville sojourn for Almost Blue. The Royal Guard Horns, by the way, were pre-eminent sessioneers Annie Whitehead and Gary Barnacle. ← What if The Beatles had never formed?